Well, autumn arrived with a bang. We have had gale-force winds, torrential rain and there is a definite nip in the air. It is getting dark earlier and the first autumn leaves are starting to fall from the trees. I did some more de-cluttering. During my previous de-clutter, I put some of those ‘just in case’ items in boxes and left them out of sight for a while to see if I would miss them. I did not, so it was time for them to go as well. I have been enjoying the extra space and not just the space around the house. My mind is much 'spacy-er,’ too. Having less ‘stuff’ to focus my attention on has freed up my mind. I can think more clearly and I find I am able to direct my concentration on the things that really matter. Using all the items in the larder and freezer before re-stocking has given us all more time to do what we really want to do – live life. I re-organised my workspace again as well, and unearthed some blank atc’s I bought about a year ago. I had completely forgotten about them. Surprising how having so much stuff affects one’s memory. Having a bit less means we can find the things we need and remember what we have. Anyway, as well as doing all my usual drawing I decided it was time to start using the atc’s, so I decorated some with my favourite pens and inks. I quite like them and I think I might do a few Christmas themed ones, to put in along with some of the cards we send. Have a super weekend and a great PPF. Hi, Valerie. Thank you. Ah, today we have had wind, rain, sunshine and a very turbulent sky. The joys of a European autumn. Where I live, in Florence, OR. we have awful weather. Winters are rain, wind, cold, rain, wind, overcast dark, and did I mention the rain and wind. I don't mean a gentle breeze either. LOL Summer is more of the same without the rain. The cold Pacific wind carries off and warmth. The Sept. comes and the tourists leave and the warm sun comes out, the wind stops blowing and for a few weeks it is beautiful here. By Oct it starts again. I am a purger. I rearrange, get rid of things, and clear any clutter. It does clear the mind as well. I am glad you found the ATCs. These are just amazing. Love the color and the oddness of them. My kind of art. Thank you, Nicole. Your weather sounds quite similar to what we get, but hey, I have heard it said 'there is no bad weather, just the wrong clothing. What a beautiful leaf John. Yes it certain has made it's early mark has Autumn. Thank you, Tracy. Very much appreciated. Hi, Gillena. Thank you for your kind comment. Thank you, BLOGitse. I used to draw stuff like this on denim jackets for some friends. That was...many years ago now. Good times though. 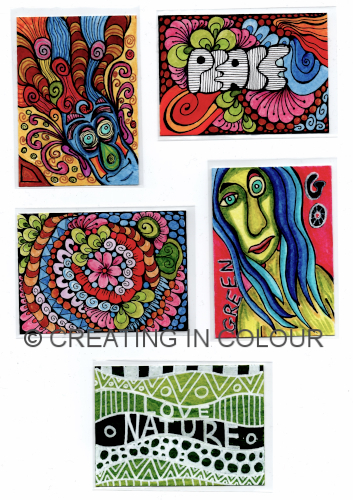 Cute colourful ATC's! Decluttering is a good thing. Your colorful art is gorgeous. Love all you show now. Autumn is here as well but leaves are still in trees. Thank you so much, sirkkis. Yes, autumn is here and hard to believe Christmas is just around the corner. Thank you, Crafting Queen. Very much appreciated. Hi, Linda. Thank you very much. Thank you, denthe. Your comment inspires me to write more and draw more. Hi, Jan. Thank you. Yes, they are great fun to do. These are the first I have tried, but I am sure I will do more. Love your share this week, I think it's time I did a little decluttering around the house too! Happy PPF! Thank you, BrownPaperBunny. De-cluttering and being more mindful has had a real impact on my life. A good impact. Thank you, Miss Marple. Yes, it is good to work on something small for a change. I find doing these can lift the boredom that sometimes comes with a bigger project. Thank you, Jennifer Rose. 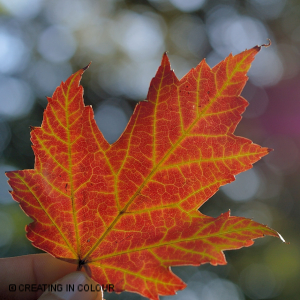 I have seen photographs of Canada in autumn. It looks stunning. Guess we will have to make do with what we get. Thank you, NatureFootstep. The art can create a lot of clutter, but I have 'downsized' my art stuff, too.